bl.uk > Online Gallery Home	> Online exhibitions	> Asia, Pacific and Africa Collections	> Chutter Munzil, Lucknow. 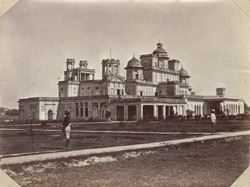 Photograph of the Chattar Manzil in Lucknow, taken by John Burke in the 1860s, from the Edward Molyneux Collection: Album entitled 'Indian Photographs'. The Chattar Manzil or Umbrella Palaces (1820s) were named after their triple umbrella pavilions or chattris. The larger, or Bari, Chatter Manzil has three storeys with a series of underground rooms. Both the Bari and Choti Chatter Manzil, the two main buildings in the complex, are built in an Indo-European style.